First batch of summertime stone fruit jam! Spiced peach and apricot. Yum. December has arrived and we are welcoming the silly season with open arms! From (and including) Monday 24th December - Thursday 3rd January. We will re-open on Friday 4th of January. Wishing you all safe and festive festivities! of a veteran having worked all around town before starting off on his own tangent with Clement. It's a beautiful store and really worth a visit. 3pm as always. We will have a separate brew bar operating in the window for a bit of fun. Come and try some of our coffees on offer as well as our tea range! We are finishing up on Market Lane's seasonal blend and the Santa Isabel COE. It's been quite an enjoyable week. Sad to see it go, but excited for what's coming in this week. We have Seven Seeds' current espresso blend made up three Central Americans. 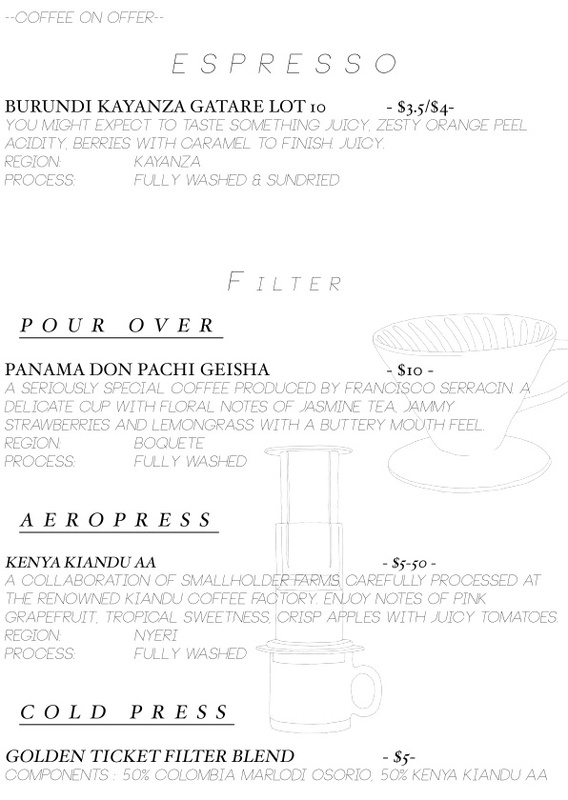 Also, on offer for filter is the Kiangai Kirinyaga, Kenya. Really beautiful Kenya with typical blackcurrant & floral tones. Also we can't say at this stage what they will be, however we will have some new teas coming in. After a tasty impromptu tea cupping with Nathan Wakeford from Somage we will picking out some of their reserve selection to compliment our current selection. While on the topic I might as well touch on our current range and our tea practices. We have been brewing with our current methods for the last couple of years with much guidance from David and Pasquale at Larsen and Thompson. We choose to control our parameters (tea weight, water, temp, time) when brewing our single estate teas. It's with this control that we are able to achieve correct infusion for each customer and customised conditions for each tea. These methods are not new or innovative, however they are not commonly embraced in a cafe environment. More common is a 'bang-it-in-a-teapot' model which leads to unpredictable results in the cup. Our recipes are ones that we have come to through testing and tasting. However they are not beyond question. We love interacting with anyone and everyone about great tea so if anyone has any questions or queries as to our practices or why their tea has no leaves in it, or why it's not in a giant pot then we would love to hear from you. If you are at all curious about tea then I would recommend going to Storm In A Teacup on Smith St in Collingwood. Amazing tea and amazing people. For tea brewed in a similar manner I would recommend Monk Bodhi Dharma and Proud Mary. The latter is a particularly good example of what is possible in a cafe environment and why we shouldn't settle for compromises. As of this month we are open 7 days a week. So opening hours are as below. We have been fortunate enough to have some great coffees over the past few months. We will strive to do a better job announcing what is on currently and what is coming up in the future. Standouts have been Market Lane's Seasonal Espresso blend & their Kenya Muchai, Proud Mary's Crazy Eye blend and of course all those Geisha's!! As always Small Batch's seasonal Candyman Blend is a winner as has their Kenya Gatomboya which we are serving as filter currently. We have a couple of Africans from Small Batch coming in at the end of this week. Ethiopia Guji Shakiso as filter and a naturally processed Ethiopia Yirgacheffe. We talk about processing a lot without explaining ourselves well enough. Linked is the Sweet Maria's glossary. An amazing site for information and definitions. Far more eloquent than us! Two El Salvador's from Monk Bodhi Dharma in Balaclava will be in next week. Later next week we will have Market Lane's new Seasonal Espresso made up of three Guatemalans, as well as El Salvador Santa Isabel which is a Cup of Excellence winner (#17). We want to welcome Joe and Claire (not that new) to our roster. Congratulations to Lachlan and Fibi who have just got engaged. Exciting new menu (of two weeks ago). French toast is there for the sweet teeth out there. Baked eggs are back after a long hiatus. My personal favourite is the poached eggs with corn off the cob, smokey chorizo and lime paprika mayo. 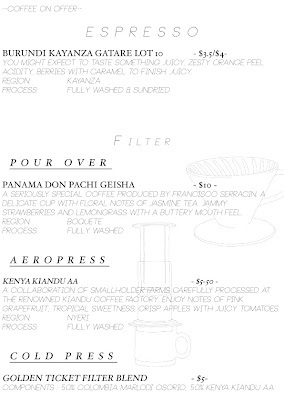 New coffee in this week: On the filter bar we have Panama Don Pachi Geisha and Kenya Kiandu AA. Espresso is the Burundi Kayanza Gatare Lot 10. These coffees are deserved of their own post (to come). Recently had Small Batch's Golden Ticket filter blend. Had some great brews using it, we thought it suited french press and cold drip really well. Although not serving it at the moment, we also had some success with our all ceramic Czech pour over cone courtesy of Fibi! It's lovely to have new members Jane and Kirsten on board over the last couple of months.